Now your Princess will enjoy her own fairytale while playing in this beautiful large bouncer along with the cherished Disney Princesses. Your party celebration with Cinderella, Snow White, Sleeping Beauty, Belle, Jasmine and Ariel will be one she will remember. 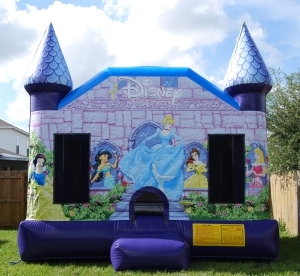 You will discover that our licensed Disney Princess bounce house is an ideal choice for a Princess and her royal playmates for enchanting fun and imaginative play!